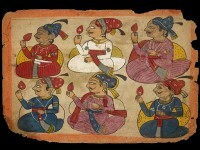 In versions by the Persian poets Nizami and Amir Khusrau of Delhi, the old Arab tale of the separated lovers Layla and Majnun became a favourite subject of Mughal period painting. The young lovers first meet as children. Later, when prevented from seeing Layla by her family, the distracted Majnun (‘Mad’, ‘Possessed by jinn’) becomes a solitary wanderer in the wilderness. Chanting poems of love for Layla, he keeps company with the wild animals, holding court among them like a human king. 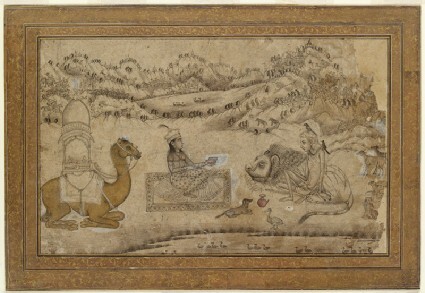 In this later scene from the story, the now-married Layla pays a visit to Majnun in the wilderness. She holds a volume, perhaps of his verses, and her riding-camel rests nearby. 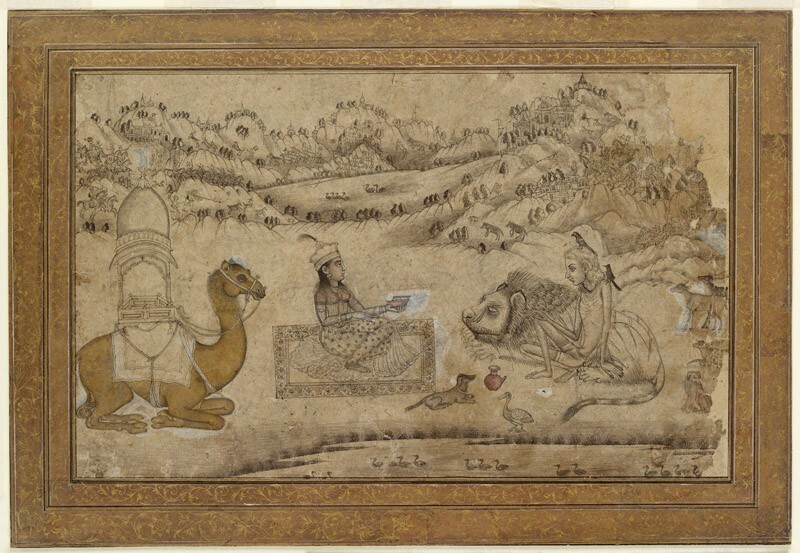 The emaciated Majnun receives her courteously, resting against a gruff-looking lion as his throne cushion.